NASA's Aqua satellite captured images of several large fires burning in the Northwest on Sept. 17, 2012. It's been a bad summer for wildfires, and even with autumn's cooler temperatures approaching, the fires still burn. NASA's Aqua satellite captured images of several large fires burning in the Northwest on Sept. 17. Smoke can be seen billowing from the blazes in the image and red outlines show where the fires burn the hottest. Some of the blazes, like the Halstead and Mustang Complex fires in Idaho, have been burning for months. 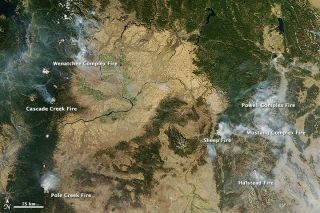 Others, like the Sheep and Pole Creek fires (in Idaho and Oregon, respectively), were ignited in the past couple weeks. Montana's Dugan fire, pictured in a second image obtained by Aqua on Sept. 15, was discovered in Custer National Forest last week. That image also shows towering pyrocumulus clouds that formed after the fire's intense heat pushed air high into the atmosphere. Pyrocumulus clouds sometimes generate intense thunderstorms that can either dampen the flames with drenching rains or propel the fire with strong winds. Wildfires raged through Colorado and throughout the Southwest earlier this summer, before shifting west and north. As of yesterday, Washington, Montana and Idaho were the hardest hit states, with 19 large active fires between the three, according to the National Interagency Fire Center. The fires leave a scorched landscape behind them, as can be seen in satellite photos of the Bagley fire, which charred 72 square miles (186 square kilometers) of the Shasta-Trinity National Forest near Big Bend, Calif., this summer. The size and frequency of wildfires has increased significantly in the western United States over the last few decades due to climate change and changing forestry practices, according to NASA. Climate change has decreased winter snow cover, quickened the arrival of spring and intensified heat waves in the region — all of which add to fire risk. Decades of fire suppression have also left denser forests and abundant fuel on the ground that cause fires to spread easily. The 2012 wildfire season will likely break the U.S. record for the largest area burned, set in 2006 when more than 13,745 square miles (35,600 square km) were torched. The National Interagency Fire Center has been keeping records since 1960. NASA's Aqua satellite captured this image of Montana's Dugan fire on Sept. 15, 2012. The fire formed towering pyrocumulus clouds. As of yesterday (Sept. 18), there were 27 large fires burning across seven states, according to the National Interagency Fire Center. Fires have chewed through 13,094 square miles (33.913 square km), an area larger than the state of Maryland. That's above the 10-year average for this date, which is 10,119 square miles (26,207 square km).